Home » Costumes from Friesland in the 16th Century. Top row left to right: Citizens in the clothing of Dithmar in 1590. Man in clothes of Eiderstedt. Right: Woman in the dress of Stadt Holm in the 1590. Man from the North Sea beach. Man in costume from Stapelholm. Man from the North Sea beach. 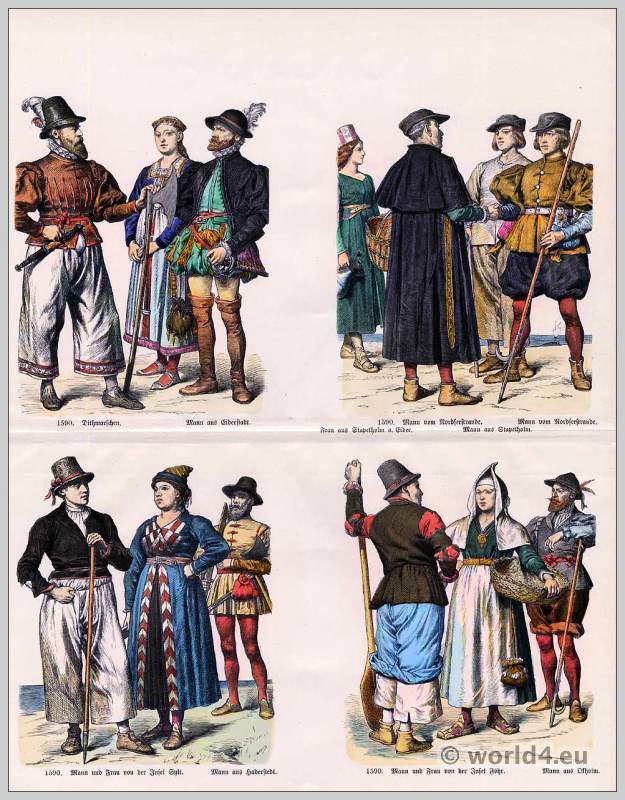 Bottom row left: Man and woman in costume he of the island of Sylt. Man wearing costume of Haderstedt. Right: Man and woman in costume it from the island Foehr. Man wearing costume of Ølholm. This entry was posted in 1590, 16th Century, Germany, Middle Ages, Traditional and tagged Medieval costume, Münchener Bilderbogen, Renaissance fashion era on 1/10/14 by world4.